South Jersey Sports Online - Ask The Athletic Trainer! Disclaimer: Information provided on this web site is intended for educational purposes only. This information should not be a substitute for professional medical care. Assuming that you have sustained a hip flexor strain, it is important that you provide yourself with the proper initial care. Initial treatment consists of ice (20 minutes on - 40 minutes off), rest, and very light stretching for the first 24-48 hours. After appropriate rehabilitation, including strength and flexibility exercises, the athlete should be given a return to participation evaluation. If the athlete's strength and flexibility in the injured leg is at least 85% of the uninjured leg, then full participation may resume. Before the game, the athlete should warm-up and stretch. After the game, the athlete should again stretch and then ice. - T.G. It is important to first ascertain the nature of the problem. Is the problem muscular? Is there nerve involvement? Is it a boney or ligamentous problem? Assuming that the pain is caused by a muscular injury, there are steps that can be taken. Particular attention should be paid to your body mechanics in order to understand what is causing the problem. Depending on the cause of the problem, considerable benefits can be gained by increasing strength in the low back and abdominals. A static stretching program that incorporates lumbar, hamstring and hip flexor stretches is also recommended. A gradual warm-up before activity and ice after activity will also be helpful. Rest is often extremely valuable. Pay attention to your body and give it the rest it needs. NSAIDS (non-steroidal anti-inflamatory drugs) from your father may also be needed. For best results, see an orthopedic surgeon or back specialist. - T.G. A muscle pull is just another name for a muscle strain. They refer to the same injury. It is quite possible that you have a muscular strain. It could be your calf or hamstring muscle group. Muscular strains elicit pain, loss of function, joint tenderness, ecchymosis (black and blue marks), stiffness and weakness. Depending on the severty of the injury, healing can take from 1 week to 6 months. Most likely with proper treatment you are already functionally close to normal. Treatment consists of ice for 24-72 hours, rest, followed by heat, stretching and strengthening. - T.G. The athletic trainer plays a vital role, by blending together athletes and health care. The athletic trainer is constantly communicating with physicians, physical therapists, nurses, parents, coaches, and athletes. He/she is responsible for carrying out the physicians' orders, specifically exercise or rehabilitation prescriptions. The athletic trainer guides the athlete through rehabilitation while monitoring progress and conveying it to parents, coaches and physicians. In addition, because the athletic trainer is on-site, he/she has the best opportunity to evaluate the injury due to his/her proximity to the athlete. This information becomes extremely valuable to the physician. The athletic trainer performs the initial evaluations, provides advanced emergency treatment, and rehabilitation either with or without a physician's prescription. The athletic trainer is specifically trained for his/her position. No other allied health professional is better trained to deal with the athlete population. - T.G. If your go to www.NATA.org, it will tell you the information you need for your speech. In regards to the professional team question, I must admit that there are a minimal number of these positions and they are very hard to get. I myself work for the New York Jets as a season intern, and there were about 500 people that applied for the 5 positions. You really have to be blessed to get your foot in the door with a professional team, then you will have to work your way up the ladder. It involves long hard hours and you must definitely be committed to the job to be productive. - D.M. I work with both the high school and junior high school population, ages 13-18. Athletic trainers may work with all age groups. NO Sprinting or cutting until strength and flexibility are equal to uninjured leg. When you refer to the word "trigger," you go outside of my scope of practice. I do believe that your "trigger pains" are directly related to some type of trauma, malalignment, or condition. I would recommend that you seek the help of a Medical Doctor. Please let me know what the doctor's conculsion was. - D.M. First, Kelli I would like to hope the best for you in getting into the Sports Medicine program of your choice. In regard to you question I feel that it can vary a great deal. The reason that I feel this way is that as an Athletic Trainer, the relationship you have with other health care providers is directly related to your commitment to providing the best service that you possibly can for your athletes. In doing so, the health care providers that you come in contact with I think that the relationship would be great. When relationships with health care providers don't work, which I do not think happens often, I think that it would be due to individual personalities, not knowing where you stand in this team, and not having a common goal, which should be the athletes health. When and if this was to ever happen, I would think that you or whoever you were working with chose the wrong field to work in. I can say that the relationship that I have with our school physician and nurses are tremendous. When I don't know something, I will call our school physician or nurse and they will do the same. There is no room in the health care field for an ego. I hope that I have been of some help to you. - D.M. If you are willing to relocate to another part of the country and take a position in any available setting, then there are jobs for the taking. The best place to search for available positions is on the National Athletic Trainers Association website at www.nata.org. The salaries are based largely on setting, region, and experience. - T.G. Starting salaries vary according to region, setting and experience. Athletic trainers have the opportunity for promotion and salary increases similar to any other occupation. Job opportunities vary throughout the country. A complete list of available jobs can be found on the National Athletic Trainers Association web site at www.nata.org. Athletic trainers work in a variety of settings including high schools, colleges, clinics, doctor offices, in corporations, and for professional sports teams. - T.G. The first thing to remember is that your child is there to improve her skills and have fun. Safety should be the coaches and parents concern. Alternative activities should be incorporated into the camp which improve skills without causing overuse injuries to the girls. Varying activities will give the girls legs time to rest. Activities in the pool which are fun and less stressful to the body are encouraged. The coach should be observant, watching the girls individually to see that they are safe and uninjured. Alterations to the program should be made as needed and time should be set aside for rest. Making the experience enjoyable will help keep these young athletes enthusiastic about future soccer events. Keep it safe, be observant, make it enjoyable, and find a better playing surface. - T.G. This injury sounds as though there could be more damage to the structures in this region other than your tricep. Now, if your tricep is the only thing that hurts you, then you have been blessed considering you were holding a lot of weight in your hand. I am curious to know whether this counter clockwise motion took place at your elbow, shoulder, and or a combination of the two. The combination being more likely, but let's address your tricep. It is possible that you strained your tricep. A sprain involves the stretch or rupturing of a ligament where strain involves the same etiology but affects muscles. This is a common mistake made due to the similarities in the two words. Common characteristics are strength loss, ecchymosis (discoloration), local tenderness, loss of range of motion, and swelling which you have mentioned. That feeling of like after a heavy work out can trick you into thinking it is not that bad. Work out soreness (D.O.M.S.) reaches its peak intensity 48 hours post exercise and disappears within 7 days. A tricep strain could take several weeks or even up to a couple of months to heal, granted it has been placed in the right environment for healing to take place. Treatment would consist of rest, ice, pain-free stretching, and strengthening exercises. - D.M. While it is quite possible you have strained a muscle in the shoulder region, it is difficult to ascertain exactly what you did given the above information. Another possibility is a sprained shoulder ligament or joint capsule. Each injury will be treated similarly at first. My best advice is to treat the injury with ice for 24-72 hours. If there is no decrease in swelling or if the pain remains or increases, consult your family physician. - T.G. The symptoms of an adductor strain are consistent with strains in all other parts of the body. A strained muscle may produce all or some of the following: pain, point tenderness, decreased strength, decreased range of motion (ROM), stiffness, swelling, redness, increased tissue, temperature and ecchymosis (black and blue marks). Ice should be used for the initial 24 to 72 hours, depending on the severity of symptoms. During this initial period, stretching should be limited to light pain free stretching to help maintain range of motion. Gradually, heat should be introduced followed immediately by static stretching and strength training. Flexibility should continue to be increased through stretching and strength resistance training. Depending on the severity of the strain, symptoms should resolve after a few weeks as ROM and strength are returned to pre-existing levels. - T.G. The pain that you were experiencing is called D.O.M.S. or Delayed Onset Muscle Soreness. It is a quite common phenomenon effecting many athletes, especially the "weekend warrior". When stress is placed on a particular muscle group or area of the body that is different than the norm, changes occur within muscles that trigger pain and stiffness. It may be that you have attempted a new exercise for the first time, attempted to do it differently, or that you have increased the intensity. In each instance you may experience D.O.M.S. as your body adjusts to the changing stress. The exact cause of the D.O.M.S. is still being studied. Pain usually peaks after about 48 hours and subsides after about 72 hours. The pain in your bicep tendon and tricep is caused by performing the bicep curl and bench press. To decrease the intensity of D.O.M.S in the future, you should begin new routines slowly and gradually increase intensity. Stretching would be practiced both before and after exercise. Finally, learn to accept that you will experience D.O.M.S. to some degree almost every time you make changes in your exercise routine. - T.G. Arthritis is a condition in which I am not well trained and is generally considered to be outside "the scope" of athletic training. An orthopedic physician is the best person to answer your question. However, I will try to give you what little information I have gathered. The chance of developing arthritis depends on many factors, including lifestyle and family history, as well as, the addition of this injury. Developing arthritis in your hand depends largely on whether the fracture was within the joint capsule or outside the joint. Arthritis occurs in the joints of the body. Fractures outside the joint should not increase the chances of developing arthritis. - T.G. There is a huge amount of information available to you through this web site. See "Sports Medicine Links" at the top of this page. You can find information on the National Athletic Trainers Association web site (www.NATA.org). This web page contains information on all aspects of athletic training. In addition there are numerous other sites available through this web site. - T.G. Interesting question, I am use to being asked questions in regards to physiological or mechanical problems. I do not think that there is any easy solution to your problem. You have mentioned that your school district does not have funding for a full time athletic trainer. I would see if they could fund a part time athletic trainer. This way they are paying him or her for their time served. They are not offering them a benefit package or anything of that nature. The other question was there any possibility for work study or a volunteer. Unfortunately there in none that I know of. I personally think that it would be hard to find someone to work for free because that time that they are practicing would interfere with there actual job. You also asked who could qualify. Only an certified athletic trainer can qualify. There is a liability issue when there is someone covering an event that is not certified. I do know someone in the Pennsauken area who is possibly looking for some part time work, so let me know if anything changes. I hope that I have been of some help to you. - D.M. If there is a lack of funding available for an athletic trainer, then there are a few options. Because athletic training is a specialized degree, there are really no substitutes available in the allied health professions more qualified short of an orthopedic physician. 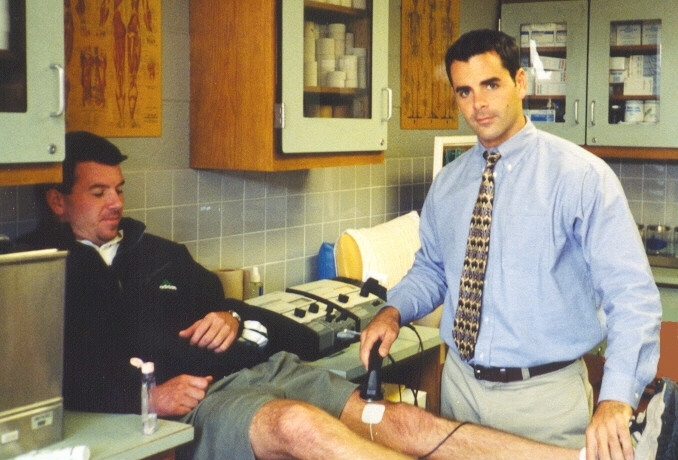 The athletic trainer's education and experience is geared specifically to athletic health care. Local colleges may have students near graduation willing to assist you. Be careful whom you choose. To be safe, make sure that the individual is qualified and competent. Make sure you are protected legally. You may also choose to advertise in the newspaper or on our website. There are certified athletic trainers in our area that are available per diem. Protect yourself and your children. Be sure the individual you use is certified by the NATA and registered with NJBME if possible. I can be contacted at (609) 309-7344. - T.G. Currently, you must possess a bachelor's degree. You do not have to major in athletic training, however, you must have a number of prerequisite courses in the athletic training discipline. These programs are being phased out. Soon, only approved curriculum programs will be available to graduate students majoring in athletic training. After completion of the prescribed course work and 1500 hours hands-on experience, you are then eligible to sit for the National Athletic Trainers Certification Exam on the date closest to your anticipated graduation date. If you pass the exam in New Jersey you may then register with the New Jersey State Board of Medical Examiners and begin employment. - T.G. Quite often elbow pain can be caused by poor throwing mechanics. While throwing, there is a large amount of stress placed on the inside of the elbow as well as the biceps and rotator cuff muscles as the arm rapidly whips through a range of motion and then quickly decelerates. Have someone with knowledge of throwing mechanics watch your throwing motion and make the appropriate changes. Many times pain can also be caused by weak or inflexible arm muscles. A small amount of stretching and strengthening can go a long way. Stretch the bicep, tricep, wrist flexors, wrist extensors, and rotator cuff muscles before and after each throwing session. In addition, be sure to ice the arm after throwing, and then rest! If pain persists, seek a physician. - T.G. Thomas Geary, ATC, CSCS, received his Bachelor of Arts degree in Health & Exercise Science from Rowan University. Currently he is the Athletic Trainer at Lindenwold High School and is a graduate student at MCP Hahnemann University. 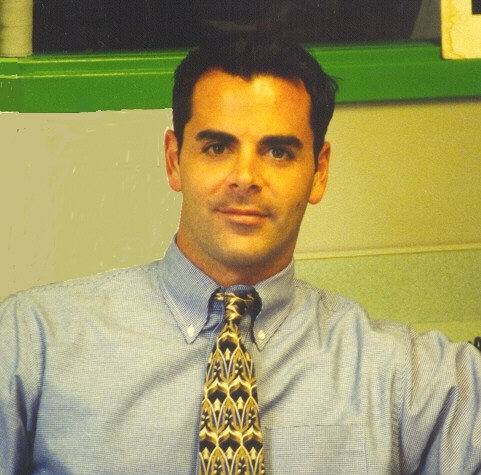 He is a certified member of the National Athletic Trainers Association, the Athletic Trainers Society of New Jersey, the National Strength and Conditioning Association and is a registered member of the New Jersey Board of Medical Examiners. Dorrell Morrison, ATC, CSCS, is a graduate of Rowan University with a degree in Health & Exercise Science with a concentration in Athletic Training. Currently he is the athletic trainer for the Pennington School and a personal trainer with the Sporting Club at the Bellevue in Philadelphia. He has also worked with the New York Jets Sports Medicine Staff. He is a Certified Athletic Trainer by the National Athletic Trainers Association, and is a Certified Strength & Conditioning Specialist by the National Strength and Conditioning Association.